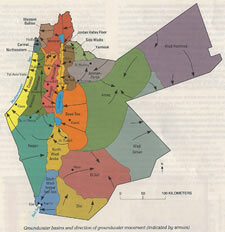 The increased pressure on scarce water resources, coupled with inadequate treatment of point and nonpoint sources of pollution, have caused a rapid degradation of chronically depleted water resources, contributing significantly to the ongoing conflicts in the region in general and to the Palestinian-Israeli conflict in particular. Further, transboundary movement of pollutants from one entity to another endangers the shared water bodies, which without adequate treatment pose a health risk to the population who are dependent on these resources for their drinking water. Accordingly, the aim of the project is to conduct, under a multinational collaborative effort, an assessment of current and prospective deficiencies in water quality, providing an account of water quality conditions, treatment, risk assessment, and prospects for alleviation and mitigation of poor water quality, and environmental degradation. The proposed geographical area for the planned study is shown in the map below. The project was approved at the end of 2008, and initiated in 2009. The first meeting of the group was held in Amman, Jordan, the 15–17 November 2009. The group comprises 17 scientists from the region supported by other U.S. and European members of the Chemistry and the Environment Division and CHEMRAWN. The group is divided into four subgroups, each dealing with the compilation and evaluation of data of each entity before integration and assimilation of the data into a regional report. The working group composition is given on the project web page. Groundwater basins and directions of groundwater movement under study in this project. 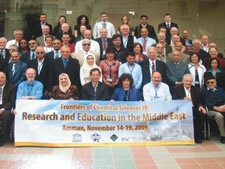 Twelve members of the working group and two invited guests—Liev Sydnes, IUPAC past president and currently chair of CHEMRAWN; and Nicola Senesi, president of the Chemistry and the Environment Division—were able to attend the meeting, which was part of the Malta IV Conference “Frontiers of Chemical Sciences: Research and Education in the Middle East.” The meeting aimed to overcome prejudices and antagonisms among people and enable cooperation among individuals despite their political differences. The working group also presented a seminar by Heinz Hoetzl of the University of Karlsruhe, entitled “Improving the Availability of Water Resources for Arid and Semiarid Areas by Means of Integrated Water Resources Management,” which reviewed the hydrology, water usage and water quality issues facing the region. additional funding required to implement tasks focused on data collection, data analyses, and development of policy options. Participants at the Malta IV Conference in Amman, Jordan, 14–19 November 2009. The fast-increasing desalination activities in the region may threaten the environmental quality of coastal and marine ecosystems, as well as degrade marine water quality. The creation of a collaborative, multidisciplinary research group is suggested to evaluate the impact of thermal discharges, brine disposal, and other desalination process emissions on coastal and marine water quality. Meeting attendees proposed a study of the impact of air quality water quality in the eastern Mediterranean region. Such research would evaluate primary air pollution emissions from cities, industries, and agricultural activities, and ambient air-quality data across the region. The initial “Phase 1” study area is to be expanded to the north to include Lebanon and Syria, which share many of the same water sources. Results of the initial study would be disseminated to motivate “Phase 2” studies that include Egypt, Libya, and Sudan to the west and Iraq, Kuwait, Saudi Arabia, and the Gulf states to the east. The progress achieved by this collaborative activity during Malta IV should provide the momentum necessary for its continued success in addressing the acute crises of clean drinking water and ways to build bridges over transboundary waters. Further information on the progress of the ongoing regional water quality assessment project, and issues associated with the project, may be obtained from Yehuda Shevah <ysheva@gmail.com>.